The Duānwǔ Jié festival is celebrated on the 5th day of the 5th month of the lunar calendar, which varies on the Gregorian calendar. This year, it falls on the 23rd of June. The Duanwu Festival is believed to have originated in ancient China. Several versions of traditional folklore have been told of the origins of this festival, however, the best-known story is still the one that commemorates the death of a poet and statesman named Qu Yuan (屈原) (c. 340BC – 278BC) of the ancient state of Chu, during the Warring States Period of the Zhou Dynasty. A descendant of the Chu royal house, Qu Yuan served in the royal court. A wise and honest man who fought corruption, he antagonised other less honourable court officials who raised damaging whisperings into the Emperor's ears. 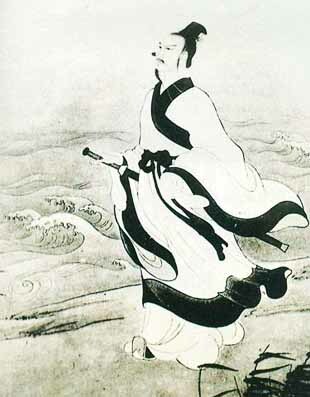 Qu Yuan was subsequently dismissed from the court and banished from the state. During his exile, Qu Yuan wrote poetry which became masterpieces for which he is now remembered. When the Qin state conquered Chu state, Qu Yuan became dismayed at the decline of his motherland and committed suicide by drowning himself in the Miluo River on the fifth day of the fifth lunar month. The locals who admired Qu Yuan paddled out on river to retrieve his body and threw rice dumplings wrapped in bamboo leaves, among other things, into the river to prevent fish from eating the body. 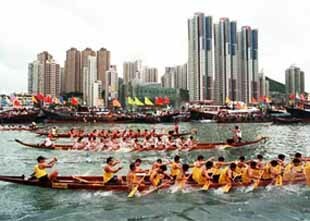 Thus originating the two traditions that form the main focus of this festival - eating rice dumpling zòngzi (粽子) and racing dragon boats. 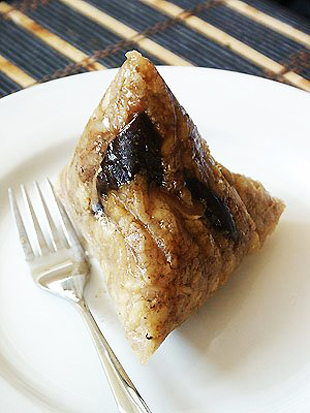 Zongzi are made from glutinous rice with fillings such as meat, mushrooms and chestnuts, then wrapped in bamboo leaves. Fresh bamboo leaves are best as the taste and fragrance of the fresh bamboo leaves become infused into the zongzi. Unfortunately fresh bamboo leaves are hard to find so its now common to used dried leaves soaked to soften before wrapping. The festival has long been celebrated as a cultural festival in China. However, the Chinese government did not officially recognize Duanwu as a public holiday until 2008, when Duanwu Jie was celebrated as not only a festival but also a public holiday for the first time in China. Now it is still observed among the Chinese community in Asia and come June 23rd, triangular rice dumplings will be served and dragon boats will be raced to remember the patriotism of one man and his love for his homeland.